OCCC and Big Truck Tacos are teaming up to help students with their appetites and their futures from 11 a.m. to 1 p.m. April 7 in parking lot D.
Students can stop by and get a taco as well as scholarship information, said Lealon Taylor, Institutional Advancement executive director, and Jennifer Harrison, Institutional Advancement development director. Taylor and Harrison collaborated on the idea of bringing in the Oklahoma City icon Big Truck Tacos to increase awareness of the “Fund for the Future,” the college’s general scholarship fund. “We want everyone to come by the booth and find out what sort of scholarships are available,” Taylor said. Taylor also said 10 percent of the proceeds from sales will go to the fund. Tacos will be $3.25, Big Truck Tacos regular price. Big Truck Tacos is located at 530 NW 23rd Street in Oklahoma City and sells a variety of Mexican street food with a unique twist. Taylor said Big Truck Tacos is excited to take part in the event to raise money for OCCC students. OCCC and Big Truck Tacos both plan to advertise on Facebook pages, he said. 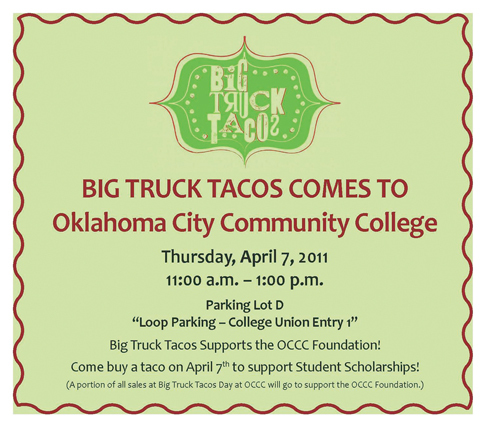 For more information on “Fund for the Future,” contact Taylor or Harrison at 405-682-7548 or visit OCCC’s Facebook page at www.facebook.com/otriplec and Big Truck Tacos’ Facebook page at www.facebook.com/big-truck-tacos.